Hi. I'm an AGA 1-dan in Boston, MA. E-mail: <chris-sl@printf.net>, Blog: Chris Ball, Web: Chris Ball. 2007-04-25: I played this magnificent B-2 bomber in a three-stone game last night. :) It's black to play. 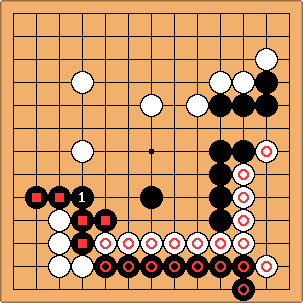 2005-12-06: A silly page wondering whether I've acquired the UltimateGoBoard. 2005-08-28: I'm going to mention some patterns I'm trying to see more often, since they tend to improve my games. Here's the first; black overplays the response to white's cap, and plays himself into a ladder. 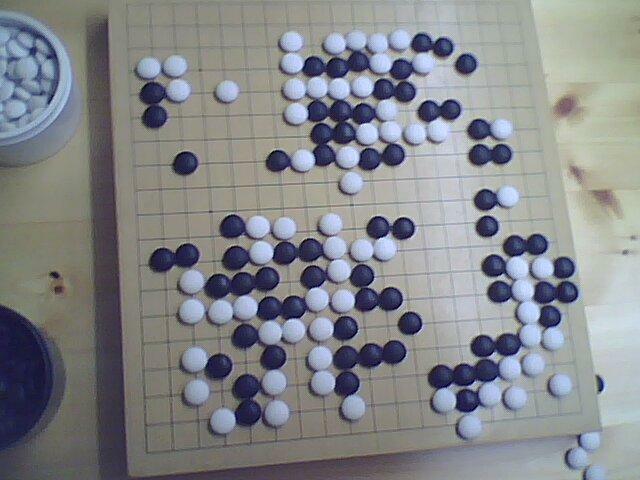 macisajt(8d) vs. Kosai, 2005-06-27: My first (and possibly last ;) time playing an 8d! It followed the usual nine-stone pattern of being ahead until early endgame, and then losing everything; I was down to 10s/move at the end. 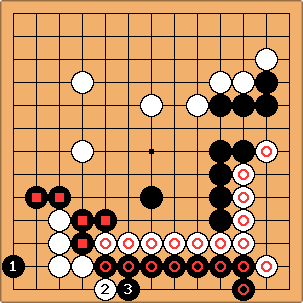 Kosai vs. rs220675(10k), 2005-06-29: I'm really happy with the willpower we both showed in the centre fighting, and really unhappy with my fuseki. Comments on both appreciated! 2005-07-01: My rank graph at the BGA. 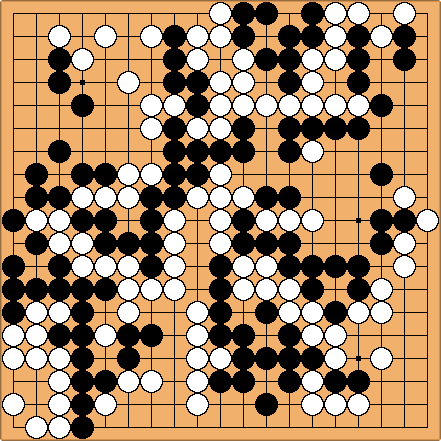 2004-09-09: I wrote a piece of software for interpreting photographs of Go boards and outputting an SGF of the state of the board. Lots of images and a movie at < http://www.inference.phy.cam.ac.uk/cjb/image2sgf.html>. Feedback appreciated! 2004-07-12: http://www.queena.com/clips/go.html is a great article. 2004-07-04: A small progress table. 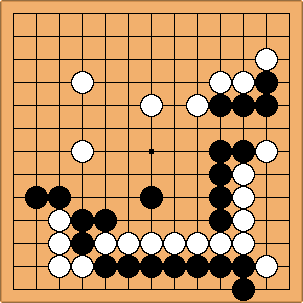 I've been playing on KGS for a few months now; my username there is Kosai. 2004-10-20:  11k     One month (predicted). Here's hoping I can make SDK before Christmas. 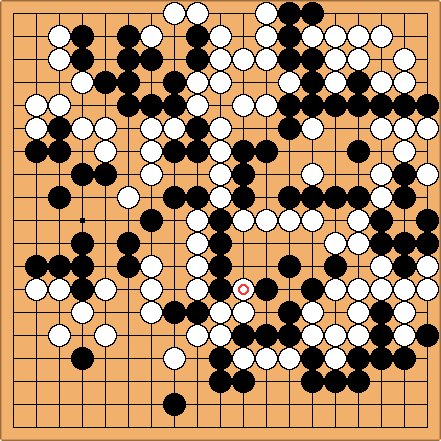 I came across this pattern in a game today (2004-03-01). I proceeded to start playing like my normal patzer self soon afterwards, losing b5-c5 after the cut on d5, and letting all of the white groups live. Are any of them ``technically'' dead, though? Black to play -- who lives? Quacki : The monkey jump at would kill the left white corner group. 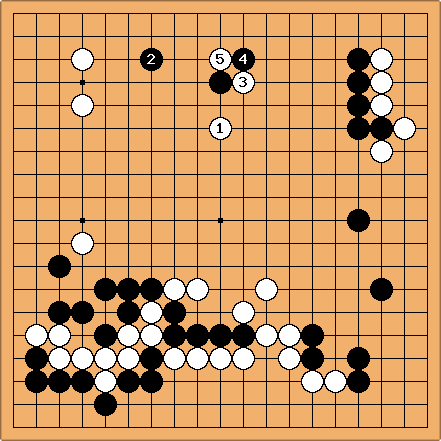 The stones with circle are basically alive (A white hane at , answered by reduces the space to four in a row, which is alive). I did not read out (if possible to me) . 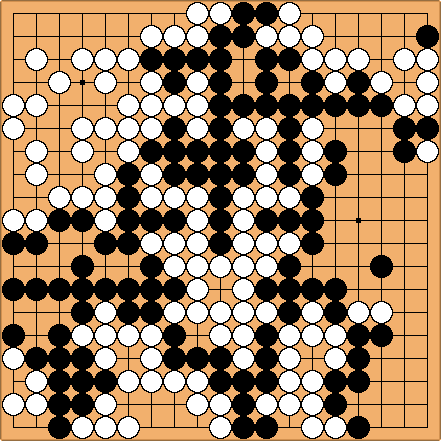 There may the possibility that white can cut and kill one of the two squared groups. 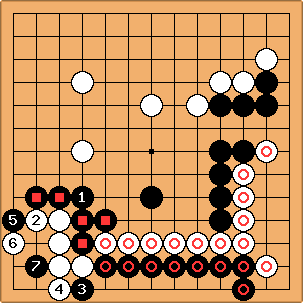 (2004-04-14): I came across this seki in a game today; unusual since black has no eyes and white has two, rather than them sharing the same number. I was playing black, and white resigned at this point -- perhaps seeing that he couldn't play anywhere without checking to see whether it was the case that I couldn't either. :-) Does anyone else have unusual sekis to show off? End position -- Black to play. I don't know if you're still working on image2sgf, but I think GoCam might be interesting, since the program seems to recognise the grid from the image.